A round-the-world trip by hundreds of British passengers has been halted by mechanical problems on board Fred. Olsen’s Black Watch. The ship has had to anchor off Chile while repairs are carried out to the steering system. Earlier in the voyage, a passenger fell overboard to his death 70 miles off the coast of Brazil. On a previous cruise last September, 130 passengers caught a sickness and diarrhoea bug. The 804-passenger vessel, which left Southampton on January 14, stopped near Isla Picton close to the Argentine border, around 50 miles north of Cape Horn, this morning because of a ‘technical issue with the ship’s steering gear’, a spokeswoman for the Suffolk-based line said. ‘It was necessary to anchor the ship in order to investigate the problem, and this is now in the process of being rectified,’ she added. The company spokeswoman said the passenger died after falling overboard in rough seas after the ship left Rio de Janeiro. ‘The ship turned around immediately and returned to search the area,’ she said. ‘A body was sighted floating in the water, but due to the bad sea conditions, with waves of up to three metres and 30-knot winds, it was not possible for the ship to recover the body. ‘The circumstances of the incident are being investigated fully, and Fred. Olsen is working closely with all the relevant international authorities. The ship is expected to continue its 114-night South American and World Voyage cruise once repairs are completed. Its next port of call is due to be Valparaiso in Chile on Saturday. Update: The ship has now set sail again. 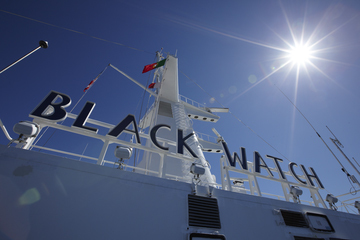 This entry was posted in News and tagged Argentina, Black Watch, Chile, Fred. Olsen, mechanical, steering, world cruise. Bookmark the permalink.